Buy wholesale duvet covers, duvet inserts, and matching accessories in bulk with Free Shipping from Palmetto Linen Distributors. Hospitality quality duvet bedding, designed specifically for quick & easy bed set ups, guest comfort, and long-lasting commercial durability. Perfect for hotels, inns, furnished guest lodging and other hospitality properties. 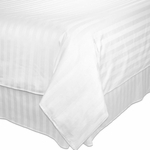 T-250 Duvet Covers: Low-Wrinkle, easy set-up duvet covers in your choice of White Dobby Stripe or White Dobby MicroCheck weave patterns. 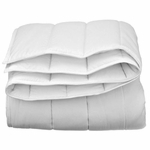 Duvet Inserts (solid white comforters): Fast drying, long lasting, non-clumping down-alternative Duvet Inserts. Recycled down-alternative Eco-fill becomes reinvigorated when washed and dried. 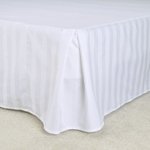 Matching T-250 Accessories: Complete your duvet bedding sets with Pillow Shams and Bed Skirts in matching white dobby stripe and dobby microcheck weaves. 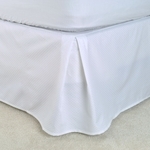 The Low-Wrinkle Duvet Bedding and Down-alternative Duvet Inserts are available open-stock (items sold separately) by the complete case pack with Free Shipping. Weather you need complete duvet bedding sets or individual duvet bedding items for your hospitality or temporary lodging property, your needs are covered! Questions? We love to help! Feel free to contact us for friendly, knowledgeable assistance.